If you are looking at maintaining a comfortable home with proper air circulation you cannot deny the importance of attic ventilation. If attics are not properly ventilated problems like condensation, wood rot, mold, mildew, and rusting metal are common problems. When such problems develop in an attic, the quality of the roof also suffers largely and when the quality of the roof is impacted it can cause health hazards to the members living in that house. And attic ventilation is a great way to keep these problems away. The main purpose of attic ventilation is to provide a consistent air circulation throughout the house. The soffit vents are screened vents in a house overhang, beam or arch that enables air to flow into the attic or the space that is below the roof sheathing. Gable vents are triangular vents that are installed in the gable wall just below the roof peak. However, gable vents are not considered much effective. Ridge vents seems more attractive because they span the entire length of the roof peak and gently blends into the roof-line. 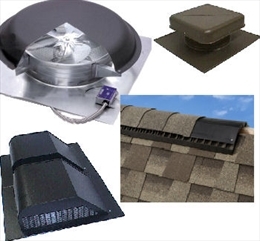 Ridge vents are considered more effective than other kinds of attic vents because they are effective throughout the year; they offer evenly distributed ventilation along the entire roof and also they have a design that maximizes airflow. Static vents on the other hand are most effective to keep at bay rain and snow. 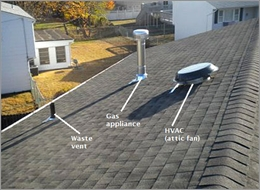 Generally these kinds of vents are installed along the roof’s face and can be extremely effective depending on the number of statics that have been installed. It is true that attic vents are helpful to maintain the comfort level of a home because it keeps away unnecessary moisture and heat. But to obtain best results in terms of low energy bills and more comfortable homes it is better to use a combination of various types of attic vents. Nevertheless, just using different kinds of attic vents are not enough to achieve a certain level of comfort within the homes. There are a few tips that need to be kept in mind in case of attic ventilation. First of all there should be a balance in attic ventilation. It means there should be 50% intake and 50% exhausts but in case a balance cannot be achieved then there should be more intake than exhaust. This is because most homes lack proper amount of intake. The other fact that ought to be kept in mind includes that attic vents should never be installed in the middle of the roof because that will disturb the natural airflow. The vents need to be evenly distributed across the roof and there should not be any kind of blockage in the vents because if the vents are blocked, the entire purpose of attic ventilation gets foiled.